Put ou-r gar-ments on the ground. Make for Him a joy-ful sound. Bless-ed is He who comes to-day. Sing Ho-san-na all the way. Print lyrics "Joyful, Joyful, We Adore Thee"
Hear the tune "Joyful, Joyful, We Adore Thee" by Beethoven. 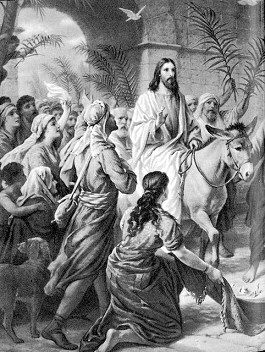 Press "Go" to search for books about the Triumphal Entry into Jerusalem.